A while back, myself and fellow tea lover The Hoggfather (or Kev if you prefer first names) were discussing the joys of dipping biscuits into tea. 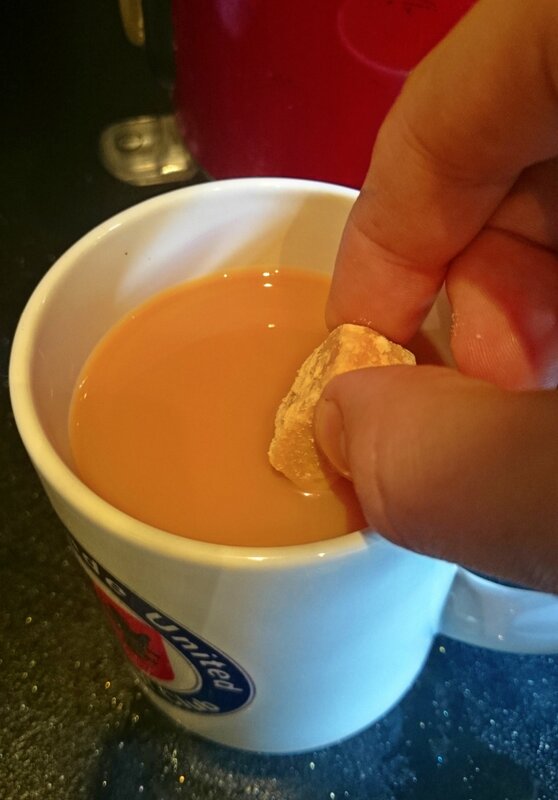 He then experimented with some tablet by dunking a piece into his brew and tasting the results. He gave it the two thumbs up. Words such as “belter” and “topper” are often used by Kev and by dunking his tablet, he was soon using his well-known adjectives once again. It was through some tablet and tea research that I discovered Curly Coo Tablet, an independent business based in Kelso, Scotland. It’s close to the border so for us folk in England we don’t have to travel too far into Alba to get there. However, it is a beautiful country and I recommend anyone going North of the Border to stay for as long as they can. Some cracking views and tea rooms. The #teaclub got chatting to Vanessa at Curly Coo about tablet and the pleasures of dipping it into a mug of tea. Much debate was had and it wasn’t long before we got to know of their own tablet which was said to ‘melt in the mouth’. Vanessa was so passionate about her product and so confident we would like it that she sent Kev and myself a sample packet. Our tablet arrived in the post and we were both keen to get the kettle on. 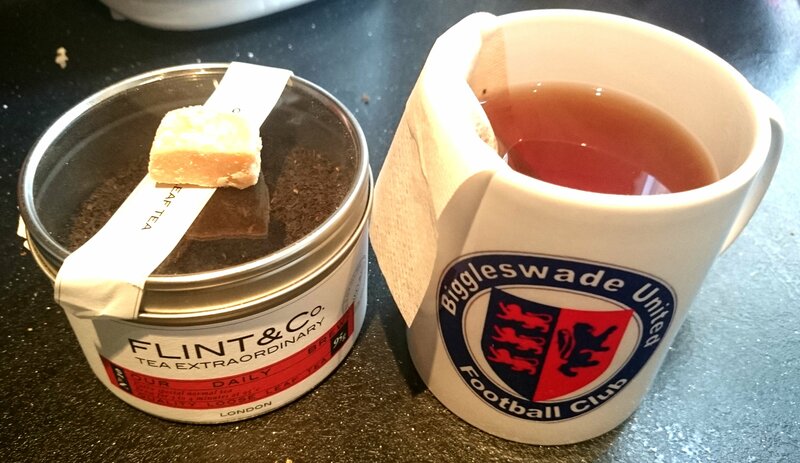 Here’s a picture of the Flint Tea (English Breakfast no less) I had with my tablet. 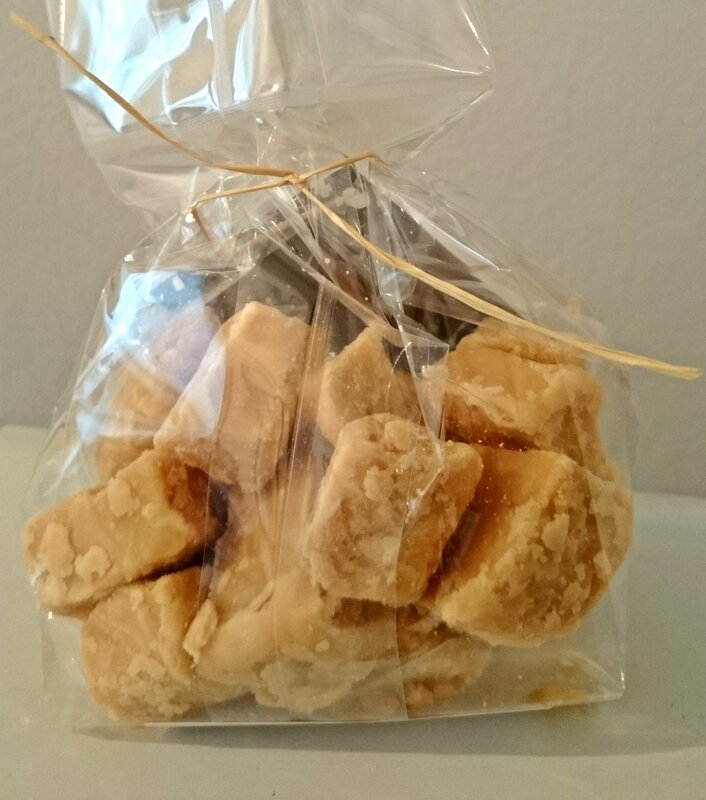 If you like fudge, you’ll love Curly Coo Tablet. 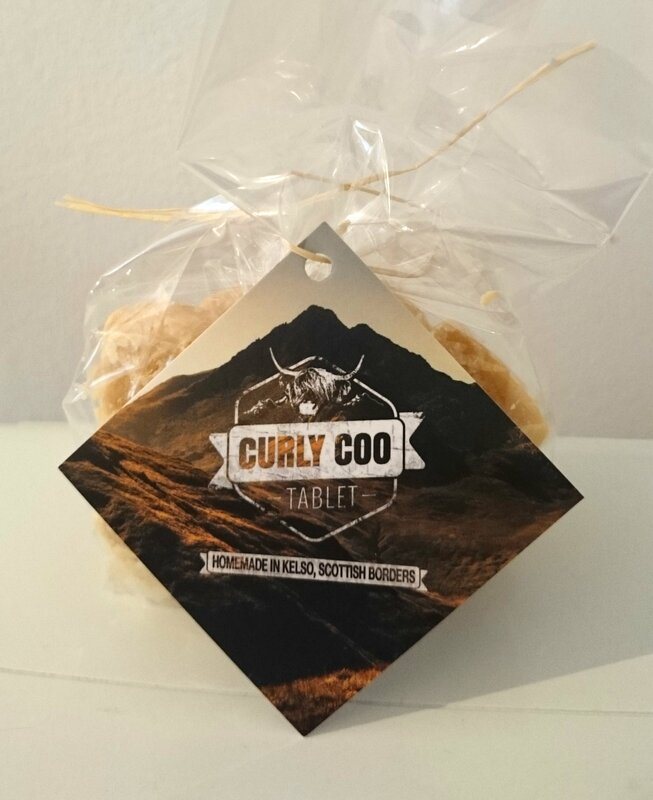 If you like tablet, then do consider Curly Coo Tablet. You won’t look back! Oh and if you like talking about Scotland, then Vanessa is a fountain of knowledge. Very passionate about the country she lives in, Kelso and the local small towns. Contact details can be found below. Biggleswade Utd. 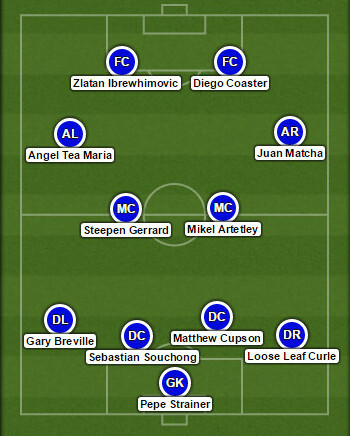 5 players I’d like to see hold the famous red & blue. Ok so I’m not going to lie, having Guillem Balague as Director of Football was a big attraction to wanting to find out more about Biggleswade Utd and lend my support for the forthcoming season. The fountain of knowledge when it comes to La Liga football and always a joy to watch on Sky Sports. Even heard him a few times on the radio offering his thoughts on transfers to and from two of the biggest leagues in the world, the Premier League and La Liga. If you follow Guillem or Biggleswade Utd on twitter you’ll have probably seen the occasional tweet involving an image of a top flight footballer or manager holding the home shirt of the Bedfordshire club. Xabi Alonso, Gareth Bale, Diego Maradona, Javier Mascherano, Pep Guardiola… the list is endless. What’s even more pleasing is the presence of current (and former) Valencia players, the La Liga team I support. Things have been positive for Los Che over the last two seasons and credit has to go to current manager Nuno Espírito Santo. Coincidentally he also finds himself on the Biggleswade Utd Hall of Fame list. Today’s tea is the Signature Blend from Thompson’s Family Tea. Earlier in the week the #teaclub received two club mugs. Perfect for match days where we can raise our cups of tea to the players and staff. As I was drinking a cup of English Breakfast I was thinking about players I’d love to see hold the famous red & blue home jersey. I started jotting down names on a scrap piece of paper whilst on a lunch break at the office. Here’s the 5 players I’ve come up with. 1. José Gayà (Valencia). Valencia seem to have a bit of a thing about producing top quality left backs (Jordi Alba, Jeremy Mathieu to name a couple) and Gayà is another example. The 20 year old broke into the first team last season and I expect him to be in the starting XI for the 15/16 campaign. 2. Óliver Torres (Athletico Madrid). Another young player with bags of potential. An attacking midfielder who spent last season on loan at Porto, contributing 6 goals in 21 league appearances. As a football manager fan, I made him my first summer signing as Valencia manager. Can only be a matter of time before he is a regularly involved in the Spanish national team? 3. Will Hughes (Derby County). Love watching this guy play for the Rams. A central/attacking midfielder by trade, he can pick out passes to unlock defenses with his vision and hold up play. Another 20 year old, like the two footballers above, Will is instantly recognisable with his bright blonde hair. Was part of the England U21’s squad in the recent World Cup. 4. Adebayo ‘The Beast’ Akinfenwa (AFC Wimbledon). What to say about this guy? He is simply a beast. Not your typical striker. Not your typical football player really but his sheer size and strength makes him unstoppable at times. Hugely popular in the football community and on social media. Good luck to whoever is marking this man in the box. Scored 13 goals in 42 games last season for AFC Wimbledon. 5. Bojan Krkić (Stoke City). A superb buy for Stoke in 2014 from Barcelona, Bojan was (and still is) one of those players I predicted to shine in world football. Whilst Stoke might be seen as a step down in terms of club stature, he was getting more playing time in arguably the world’s toughest league – the Premier League. As a striker with pace he scored 5 goals in 18 appearances before his long-term injury last season. Here’s to hoping he has a great 15/16 campaign for The Potters. Good luck to the players, management and coaching staff for the forthcoming season! Hope to get myself down for a game. 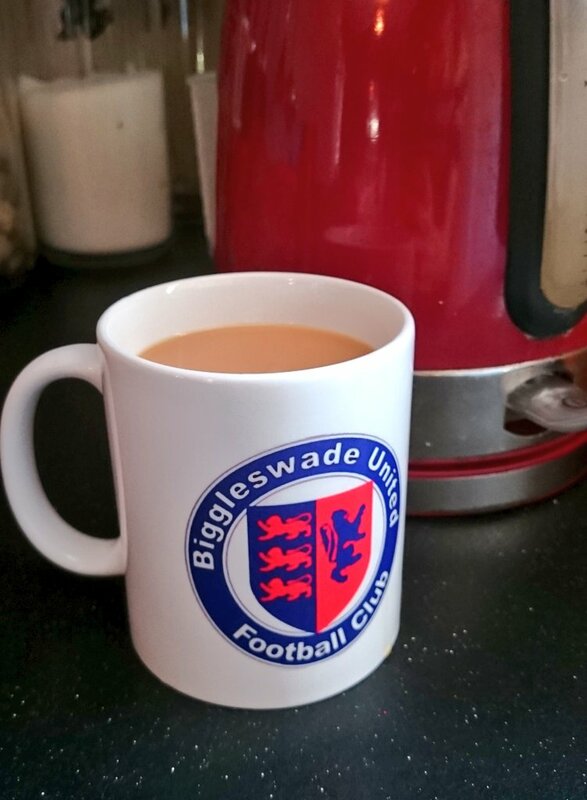 Biggleswade Utd were formed in 1959 and play in the Spartan South Midlands League Premier Division.